Branching scenarios are one of the best ways to move your click-and-read courses to something more interactive and meaningful for learners. By placing your learners in realistic situations, you can get them to practice making decisions that result in meaningful feedback and consequences. 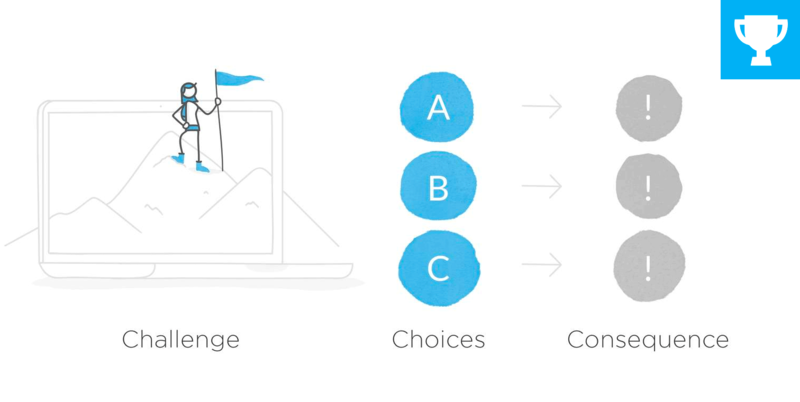 In a recent post, Tom shared tips for designing the look and feel for e-learning scenarios. I really liked his idea of creating three blank slides for each “C” in the scenario. This process can help course designers view each step in the scenario as its own event. 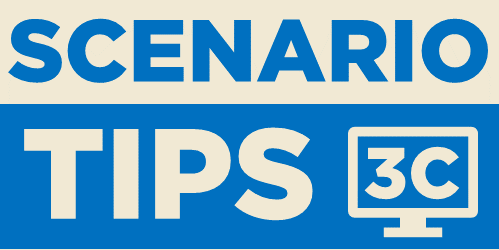 This week, your challenge is to share an example of a branching scenario based on the 3C scenario model. 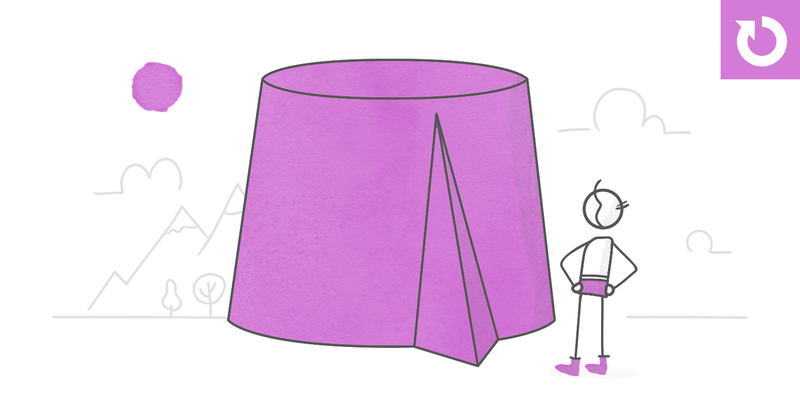 As a bonus, share the visual mockups or storyboards for your project to help others see how you built your scenario. How to Handle Cat Misbehavior: Challenges, Choices and Consequences in Rise Demo: https://bit.ly/2PAfzjV Since I know Tom K. is a big advocate for Rise, I did this 3Cs challenge using the flash cards block as my scenario options. And it's true--Rise was really fast! I gave myself a two hour deadline and had to use a topic that I know. Everyone have a great week! That's lovely Jodi. Can I ask where you got your cool cat images from? "If any of these behavior issues are a problem for you, try a house plant instead!" Haha, I like your sense of humour! Fantastic design, Jodi! I audibly laughed at this one, which is hard to make me do. Nice work! Jodi, cool to see a scenario in Rise. Your submission was the cat's pajamas! Jodi, this example is purrrfect. I laughed so hard! Awesome work! Jodi, you made my day. That's awesome! I can't wait to see more of your creative examples! :) 3D models are so much fun. Did you have a professional narrate? Lynn, Yes, we used AAP. Your audio was so professional and pleasant to listen to. I'm not familiar with AAP. Is that a company or an acronym? Thanks! Thanks Alexander, no, I didn't want to browbeat anyone. Glad you liked it. John Endicott, well done. Some interesting scenarios in there. Hi Alison, I never tested it on Firefox so I guess there are some issues. Do you have another browser you can try? Hi Alison, I am glad the name worked properly when you used chrome. I will attempt to write up how I did this at some point (the secret sauce). I am actually in the process of developing a Storyline course and am thinking of including this project for advanced users. Wow Nancy, that text entry thing was very good. I'm not sure how you were able to get relevant responses to what I wrote and having the video react to it accordingly was also very impressive. The "Are you a silent bystander" video wouldn't play BTW. Still, that was really great! The music was a nice touch as well. Thanks Daniel, I described a bit how I did this above. It is strange that the video is not working but maybe it is a good thing. It is really depressing. Very cool. I've been watching you explain for a week. I kept hurting the girl's feelings. I guess I didn't show empathy in my responses. Well done Leann, some interesting scenarios in there and cool animations. I'm a bit of a slow reader, so had a little trouble reading the instructions before they disappeared, but it was really neat. Hi Dan, Thank you for the feedback. I will change the directions slide. Sometimes when I play it I get a box or an X in place of the letters F and T. Did you have this problem? I am trying to determine if it is a browser or a storyline problem. Thanks! Alexander, that was a neat idea. Thanks Daniel, one from the vault of StyleLearn rareties. Hi everyone, A bit late but here is my CCC addition! Had fun with the animation and editing on this one. See it here: http://s3.amazonaws.com/tempshare-stage.storyline.articulate.com/sto_1crsf6s9fc7kdr2qj21b4ro89/story.html Source: https://drive.google.com/open?id=1pw1ZdDSd2jtvv7pzFAY03doqBVQlwePB Have a good weekend! Here's my design, including a blog post and the bonus mentioned above (although not a mock-up - it's a diagram showing how my branching works, because you can't see this from the published version). Because I'm so hands-on design-focused, I have a little bit of trouble working with mockups, or storyboards - although for this challenge I did start in PPT - but that didn't work too well, then I used sticky notes and tried to work out the branching on my loungeroom floor - that was a complete failure - well, not complete - I did use some of that when I started the design in Storyline... Anyway, it's a branching scenario about...branching scenarios! https://hopedianne.com/portfolio/challenge-choices-consequence/ Enjoy! Very late to this one but wanted to share anyway. https://360.articulate.com/review/content/555cf8d8-6624-4e62-b39c-6d3a20c13e8f/review Idea of this scenario is to correctly identify what improvements you can expect to see in a patient at different time periods and helps to emphasise that their are short and long term improvements of treatment. (Branding and some information removed). This was so beautiful. I am always so impressed by your submissions. Thank you for inspiring me. I have not yet been able to work out the tools section. Would you mind giving me a tip or two on how you did that bit?